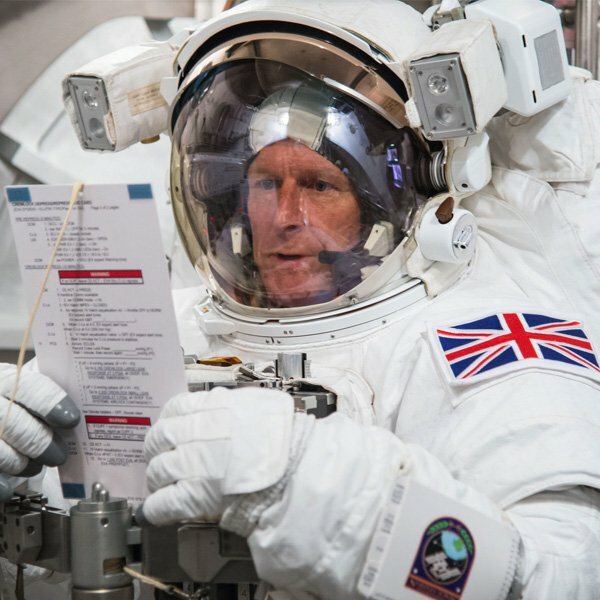 Tim Peake is the first British citizen ever chosen to travel into space with the European Space Agency, and the first Brit to stay on the International Space Station (ISS). He has been training for several years to learn everything he needs to know, and the trip will be the culmination of a whole lifetime of hard work. His job is incredibly exciting, but it’s also tough. Every day, as well as helping to maintain the ISS, he’ll have to carry out scientific experiments according to instructions given to him by the flight director in mission control, and then communicate the results back to Earth. Life on the ISS is no picnic - it’s hot, small and surprisingly noisy because it needs fans to keep it cool - and you can take only a small box of personal possessions. Still, he can’t wait to get up there and look back down to our small blue planet. A portrait of the man behind the visor - British astronaut Tim Peake. What will you do when you’re up in space? An astronaut needs to be a jack of all trades. The ISS’s main purpose is to carry out scientific research, and I’ll be working on various experiments with the other crew members. I’ll also help to keep the ISS working properly - that could involve anything from performing a spacewalk to repair a damaged solar array to fixing the plumbing on the toilet! Another important task is operating the space station robotic arm. This may be for tasks such as handling external payloads or supporting spacewalks. What’s the hardest thing you’ll have to do? One of the hardest things will be using the robotic arm for what we call ‘free flyer track and capture’. That’s when you capture a spaceship bringing supplies to the ISS. The ship drifts approximately 10m beneath the ISS, and we have to use two hand controllers to make the arm catch and grab it. In case this all sounds too easy there is also a 90-second time limit - and failure is not an option! What are you most nervous and excited about? I wouldn’t say I was nervous, but I’m sure there will be a moment of apprehension when I'm sat on top of a rocket and it’s about to launch. Also there’s spacewalking - most astronauts say the first time the hatch opens and you go out and find yourself looking at Earth 400km beneath you, it’s a shock. But the spacewalk, if I get to do one, is what I’m most looking forward to. It would be wonderful if I got the opportunity. There’s no such thing as a typical day! Sleeping can be quite hard because there is no day or night like on Earth - we see 16 sunrises and sunsets every day. In fact, there are new adjustable lights to try to help our bodies settle into a circadian rhythm. Every morning we’re told what we will be doing by mission control and they guide us at all times. We do have a short rest times, though. We can watch TV (I like to watch rugby), and there’s a guitar. I play it very badly. I know a few Oasis and Coldplay songs. You have to work with the other astronauts, but three are Russian. Do you speak their language? Yes, I do. Sometimes, we even communicate by combining words from each language - we call it Ringlish! What will it be like to leave your family for six months? That’s going to be the hardest moment, saying goodbye to family. I was in the army, and went away on six-month tours without them, so I know what it’s like to be away but this is different - you are much more isolated. My family has been so supportive though, and we are all very excited about what will happen. It’s been a lifelong passion. From an early age I just used to gaze at the stars and wonder about what was out there, and what stars and planets were made of. How does someone become an astronaut? In my case, I became interested in flying, then after leaving school I was part of a six-month Operation Raleigh expedition to Alaska to work on environmental projects. After that I joined the army and became an army pilot, and then later studied flight dynamics at university. Then I became a helicopter flight instructor, then a test pilot and began working closely with the space industry, and I joined the European Space Agency in 2009. There is no one route into this career. All my friends who are astronauts did different things before, but one thing we have in common is a passion for space. We have all worked and studied hard to get where we are. You need to be good at team work and communicating, as astronauts are only a very small part of the huge international team that works 24/7 to support the ISS. You also need to be calm under pressure, and generally fit and healthy. An interest in science is crucial as you need to have a good understanding of the experiments you do, and you need to work in lab conditions and use scientific equipment. Find out what it is that really excites you. This will no doubt also be the subject that you are best at! For me, it was an early passion for flying that led to a career as a military pilot, prior to becoming a test pilot and gaining a degree in flight dynamics later in life. Often experience and knowledge gained in one sector of industry will also be extremely valuable in another – so do not be afraid to keep all options open and explore opportunities when they arise. If you have set your heart on something you want to do, keep going, work hard, and persevere and your dreams will come true.